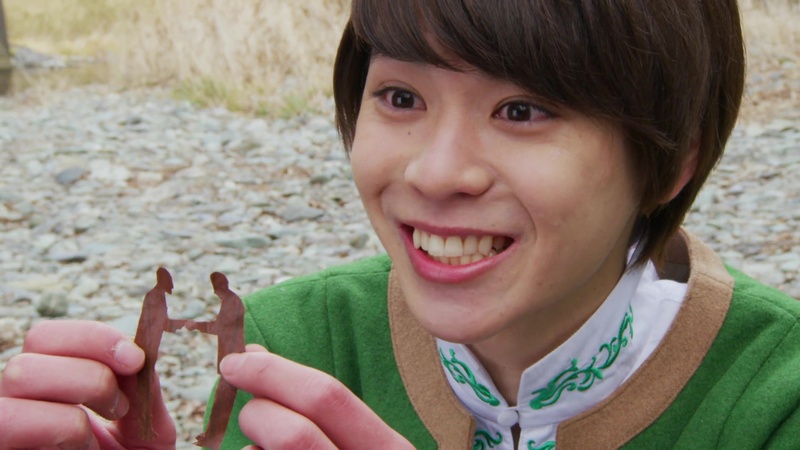 Towa and Bamba are in the suicide forest talking about how the three Ryusoulgers have befriended the Kishiryu. But Bamba senses someone listening in on their convo and he uses a Soul to drag him out. Turns out to be Koh who wants to be befriend them. Koh says the five of them together can defeat the Minusaurs and Druidons. 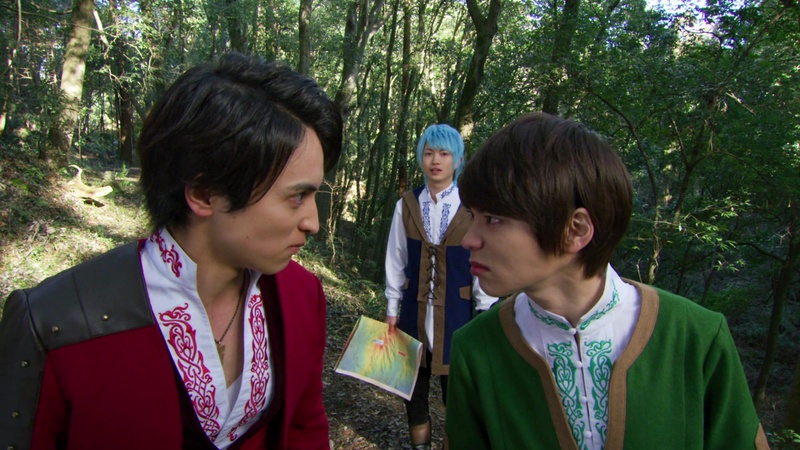 Bamba and Towa look down on him, but Koh offers to help them find their Kishiryu. 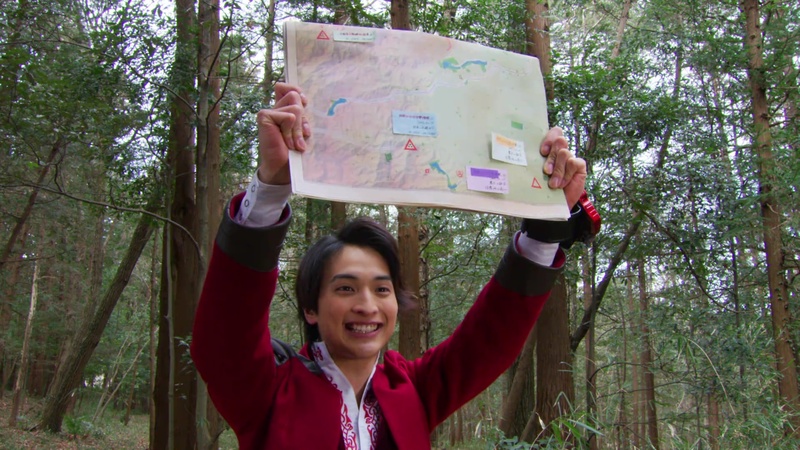 Koh has “borrowed” Papa Naohisa’s temple map. Towa suggests they duel. If Koh wins, the Bros will become their teammates. If Towa wins, Koh hands over the map. Koh agrees to the duel. They head over by the creek. But instead of going sword-to-sword, they try to see who can make the better leaf cutout. That doesn’t settle anything. Towa would rather have a swordfight. But Koh has another suggestion. Bamba is frustrated. On the other side of town, Melt and Asuna are taking on a Minusaur. Koh and Towa’s rock-paper-scissors duel is interrupted when Asuna calls Koh to tell him what’s happening. Koh, Towa and Bamba hurry over. They morph and join in the battle. Kureon sends Drunns to stop the Ryusoulgers. 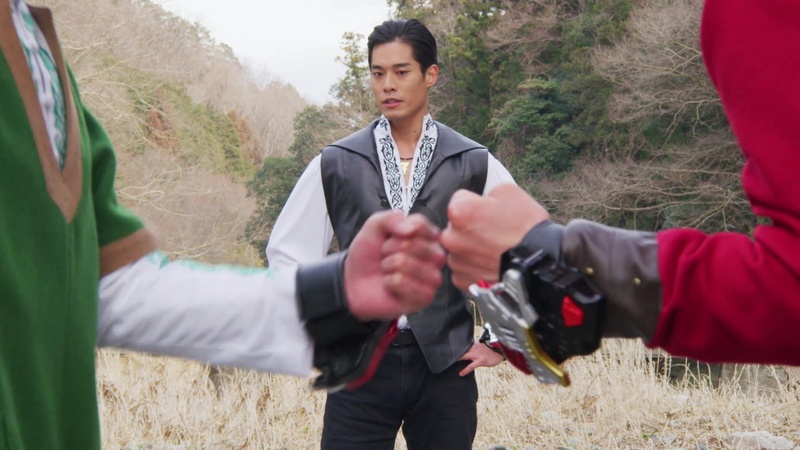 Towa suggests he and Koh compete to see who can defeat more Drunns and determine who wins the duel. They both Soul up, but their competition gets in the way of effectively taking on the Drunns. 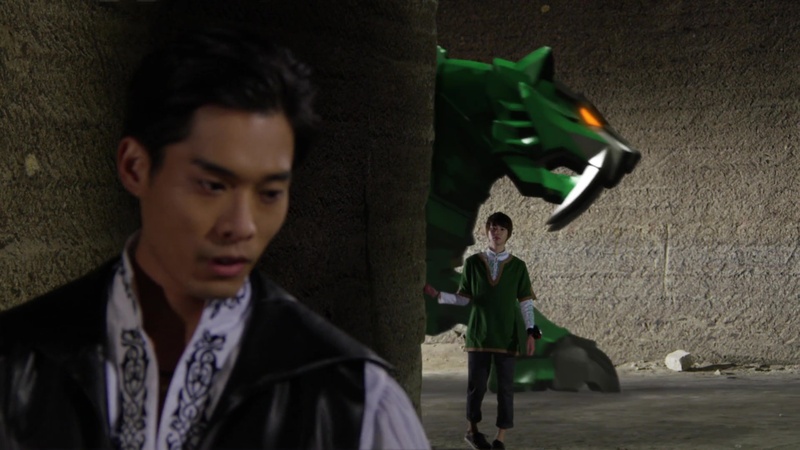 Koh and Towa decide to go after the Minusaur instead. The Minusaur stops by the fountain and kneels. 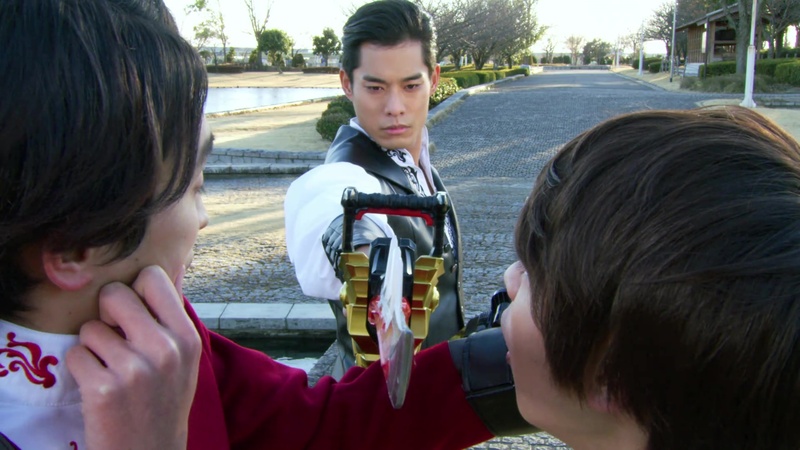 But that distracts Koh and Towa from Tankjo who pops out behind them and knocks them into the water. Bamba arrives and holds off Tankjo who is eventually able to whisk the Minusaur to safety. 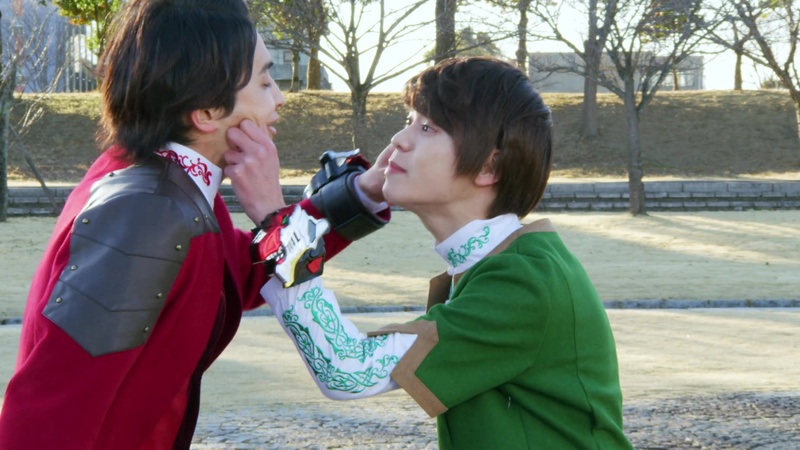 Koh and Towa argue about who hindered their efforts and they pinch each other’s cheeks. Bamba stops them and says this isn’t the time for quarreling. They hurry back over to Melt and Asuna checking on the victims of the Minusaur who have fallen into a deep sleep. They are able to find the source of the Minusaur at the hospital. A father is by his sick son’s bedside. They assume the little boy is the source of the Minusaur especially since it seemed to be acting like a child. Believing the brothers are going to just kill the kid and be done with it, Koh instead suggests they find their Kishiryu. He pulls out the temple map to show to Melt and Asuna. They split into two groups to search more temples. Asuna is a little annoyed at Bamba’s coldness. But they seem to have found a temple location. Koh, Melt and Towa also find a temple location, but it seems to be inside a mountain. Towa tries a Soul, but it doesn’t help. Koh instead calls Tyramigo to smash the mountain open, but it also doesn’t work. Tyramigo confirms there is indeed a Kishiryu at this particular temple. But Asuna calls to tell them the Minusaur has already embiggened. They hurry over. The Minusaur targets an airplane. Koh summons Tyramigo and together, they quickly drive the Minusaur’s attacks away from the plane. Melt and Asuna also summon their Kishiryu and the three of them combine into KishiryuOh Three Knights. But the Minusaur is too quick in reloading his weapons. KishiryuOh is brought to its knees. But the Minusaur also kneels. Just then, Bamba realizes what the Minusaur has been saying all along. It’s been saying to “Come over here” while lowering itself. That is, the Minusource isn’t the little boy, but the father who kneels down to want to play with his son. Bamba heads to the hospital while explaining to the Ryusoulgers that the father has been so busy, he hasn’t been able to play with his son. And that’s what the Minusaur was born out of. Bamba is about to kill the father, but Towa stops him. He has an idea. He tells Koh to reawaken his Kishiryu and suggests they continue what they were doing earlier. That is, play games. This way, Koh is able to outsmart the Minusaur and lure him over to the mountain where he uses its power to break open the mountain holding the Kishiryu. It works! Towa is able to summon his Kishiryu, Tigerlance. 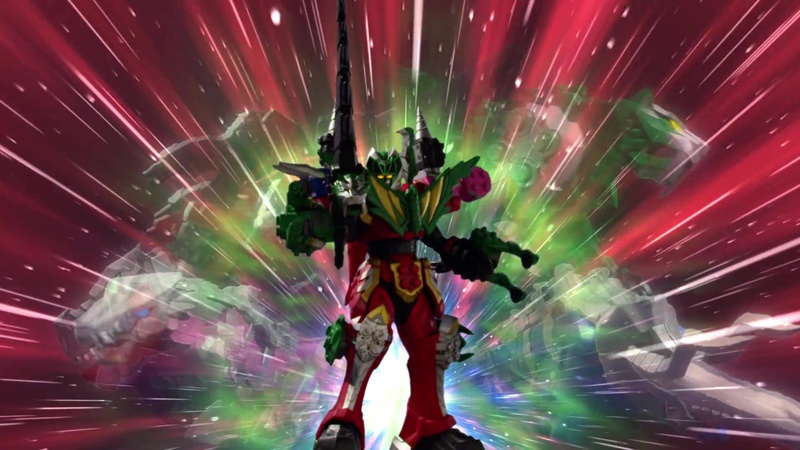 It has the same speed Towa uses as his special power. Tigerlance combines with KishiryuOh to form KishiryuOh Tigerlance. Now the Ryusoulgers have enough power to defeat the Minusaur for good. Over at the hospital, the father is back to normal. Bamba has a message for him. The father should do whatever he can to spend time with his son as in this world, there’s nothing more important than family. Bamba heads down into a temple and over to his Kishiryu, Milneedle. Towa joins him. Bamba says he didn’t think Towa would stop him from killing the father. Towa says the other three might have influenced him. 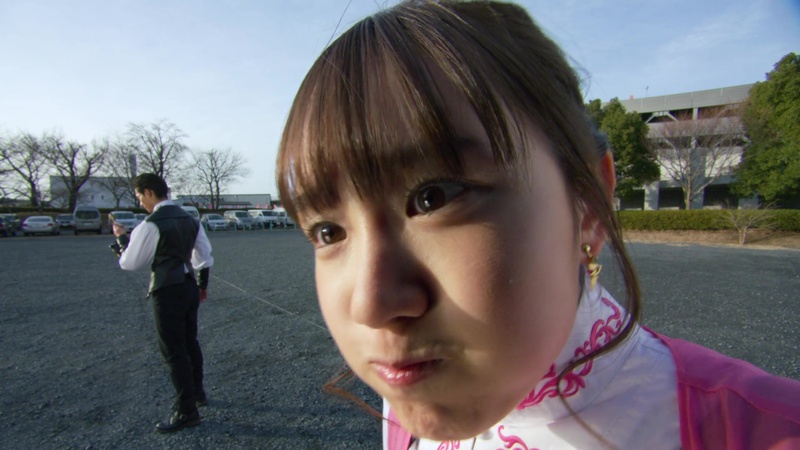 Over at the Tatsui home, Papa Naohisa comes home to Ui and the Ryusoulgers eating hot pot. But Papa Naohisa can’t believe they’ve used his research as a placemat. Well, this certainly was a far cry from last week’s debacle. And thankfully so. But the most interesting development was this 180 from Towa. Last week, he was ready to murder a suicidal young woman. This week, he has a heart now. And apparently it’s all because he spent a couple of minutes flirting with and playing games with a cute guy who wants to be his friend. Seriously though, he tells his brother that being around the OT3 has influenced him. But unless they spent A LOT of time together off-screen, that doesn’t seem like a very plausible reason for the quick change of heart. I was already surprised at the start of the episode how Towa agreed to simple games with Koh instead of an actual sword-on-sword duel. I certainly would’ve expected him to push back a little more about the little playground games as opposed to actually fighting. But he really didn’t and almost welcomed just the simple games with Koh instead. It’s almost like we missed a couple of episodes between their introduction and this episode. Just like it felt like we were missing a couple of episodes between the premiere and Ui’s situation last week. Ryusoulger‘s pretty much sped through about at least 10 episodes worth of story in this first four. Very interesting decision there. There were a lot of nice, little fun individual moments like Asuna and Bamba being paired up or Tyramigo and the mountain and Koh, Melt, Asuna, Ui and Papa Naohisa at the end of the ep. Honestly, I enjoyed the silliness of Koh and Towa’s antics. Ahnd I want to know more about Towa and Banba’s backstories.